I "Love Beets." As far back as I can remember my mom would include the roasted crimson red spheres in our nightly salads. We ate so much of them in this fashion that I grew up thinking it was the only way to serve beets. It wasn't until I started cooking for myself that I realized all the wonderful things you can do with beets. They are delicious deep fried and served with dip, as a soup or even tossed with pasta. The possibilities for this brightly hued root vegetable are endless. Since its launch in 2010, Love Beets, has been helping people rethink their idea of beets with upbeat and fun products. Their line of all-natural, ready-to-eat beet products include: marinated beets, beet bars and beet juices. No-mess and no-fuss, Love Beets come ready to eat as is and taste equally as good in your favorite recipe. Working with the Smokey BBQ shredded beets I made a simple beet jam that I served on a turkey sandwich. The combination reminded me of the classic turkey cranberry sandwich you often see around Thanksgiving. The jam could also be used to top crackers spread with brie cheese. Coarsely chop the shredded beets. Transfer to a heavy bottomed saucepan and add the sugar, lemon zest and ginger. Cook over medium-low heat, stirring often, until the jam has thickened, about 2 mins. The jam will get thicker as it cools. Store in glass jars in the refrigerator. Slightly rewarming the jam when ready to eat it will allow it to spread more easily. Spread one slice of bread with Dijon, add arugula and top with tomatoes and turkey. 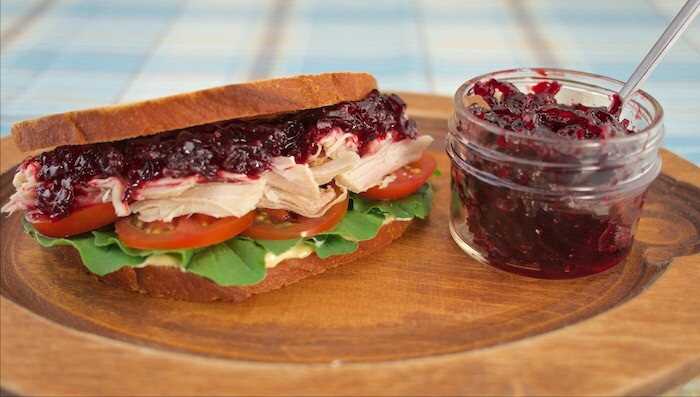 Spread Smokey BBQ Beet Jam on the turkey and top with the other slice of bread. i haven't had beet jam... yet! This sounds incredible! These beets sound amazing! I love beets, so naturally sweet. And then to make them into a jam like this... awesome! I've heard of beet jam but never seen a recipe for it; I'm a huge fan of beets so I especially love this post. Thanks so much for sharing! I need this jam in my life. Right now. Love beets, love jam. This recipe genuinely excites me, haha. I adore beets, this looks amazing!! Beet jam. Really cool. Never seen this before. Perfect for my newest beet obsession!! Thanks for sharing!! This just looks TOO good! What a great idea. I've never thought of putting something so sweet on a sandwich before. I can see how it works though! I'm new to beets but they are definitely growing on me! I've just started appreciating the flavor of beets for the past few years. I've never seen anything like the BBQ smokey shredded beets, but I'll bet it's amazing on a sandwich! I love this jam --- and how easy it is to make - with the Love Beets that already come in a Smokey BBQ flavor!! Perfect! I've never heard of smokey BBQ shredded beets but I adore beets so I've totally gotta check these out - and try your jam, yum! I love beets, would have never thought to make a jam with them, YUM!!! I've never heard of beet jam until now...clever. Wow sounds fabulous! And Love Beets are so convenient! I will try the beets! My husband just loves them. Thank you for the recipe! Usually I don't like beets - that "earthy" flavor (that's me, putting it nicely) isn't my thing, but the way that you've made it sound makes it almost sound like I could like it (gasp!). :) I know that I should get them in as much as possible because they have so many health benefits, so this is something I look forward to trying. Thanks for sharing this recipe! This sounds delicious! I love beets! What a great combination of flavors! I love beets! Ohh this is neat! I am not a huge beet fan but I like that flavor profile and I think I would like this! My dad is crazy about Beets too! I bet this jam would be wonderful with a leftover turkey sandwich! This looks like a great recipe! I love beets! This is fabulous. I've never had beet jam, but we grew up on beets. My dad was a huge fan. From one beet lover to another, I am definitely going to make this. Yes! Beets are my all time favorite! LOVE the look of this sandwich. Love this recipe too! So glad I found your blog! Yum!